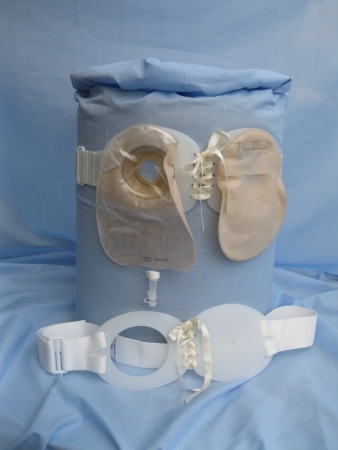 "Colostomy" belt together with a "Urostomy" belt. For a clear image of the Double Stoma hernia belt please visit the "SoftPads" page. * Sash belts are available on NHS prescription for a Colostomy, Ileostomy, Urostomy, and Umbilical Hernias and suitable for both mail and female. * Belts are custom made from information given on the following Order Form. A hole will be cut into the restraining flanges to fit the pouch/bag you normally use. * No specialist fittings are required. If necessary a Sash adviser may contact you, by phone, to discuss your requirements. A free alteration period during the first two weeks is available. * The Hernia belts have been designed and are manufactured by an Ostomist to give support to muscles surrounding the stomas and help restrict muscle damage, enlargment of the hernia, or restricting body movement. * Ideal for work, sports, gardening, housework, DIY or at any time stomach muscles require firm support. * The belt gives added confidence and security against pouch leakage or becoming detached. Helps to support the weight of a full pouch. 1. Waist overal length to be measured immediately above the hips, dipping down slightly around the the stomach and over the stomas. See inset on the "F.A.Q" page. 4. Are the two stomas appox. on the same level across the stomarch. 5. 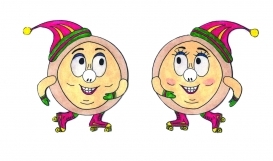 Is the right hand urostomy stoma Higher......................or Lower..................... than the left hand stoma. GDPR "Consent of the data subject means any freely given, informed, and unambiguous indication of the data subject's wishes by which he or she, by a statement or by a clear affirmation action, signifies agreement to the processing of personal data relating to him or her." Sash Medical Ltd do not share any personal information with any other body other than NHS GP surgeries.